The main benefit of watermelon to weight loss is that it is low in calories (30 calories per 100 grams). 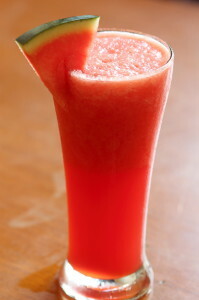 Being made up of around 92% water, watermelon is very filling and a superb diuretic. Made up of 80% water, peaches are also diuretic and cleanse the digestive tract, encouraging weight loss. Peaches are low in calories and free of fat, cholesterol and sodium, but are high in fiber and produce a full feeling for those looking for tasty snacks. Eating peaches every day can also be a great way to keep your skin looking fresh and bright. Studies have proved that pomegranates block triglycerides, the type of dietary fat that is bad for your blood. This means that the fruit attacks the fat before it can even be stored in your body. Other studies have shown that pomegranate consumption for a period of 30 days was sufficient to lower the risk of developing fatty cells around the abdomen. High in fiber, pomegranate can help you eat less because you’ll be fuller longer.